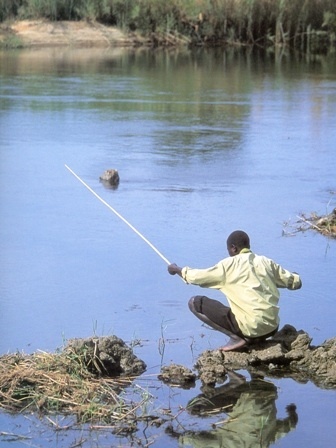 Angling for fish in one of the Okavango tributaries. Photo courtesy J. Mendelsohn. 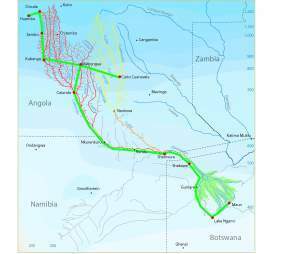 Coming, April 18 to April 29, Okavango Basin Tour driving from the source in Huambo to the Delta in Botswana. This ten day camping trip will be led by Dr. John Mendelsohn, zoologist, birder and joint author of ‘Okavango River – The Flow of a Lifeline’ a book about the Okavango River’s geography and the people that are affected by it. This is a camping trip, four wheel drive vehicle necessary and all your own camping gear. We are just finalizing last details, but if you know you want to do this trip, you can sign up now by sending an email to angolafieldgroup@gmail.com or if you have specific questions please send an email. A small registration fee to secure your place will be required.